Archer is a popular character from Type-Moon's visual novel Fate/stay night. In the game, he is the Servant (someone who fights for his or her master) of Rin Tosaka, one of the series' main female casts. Archer is a skilled fighter at projectile weapons, and has a Reality Marble (think of a special sorcery that creates an alternate reality) called "Unlimited Blade Works." To activate "Unlimited Blade Works," Archer first needs to complete a special chant. Due to Archer's popularity, many variations of his chant can be found around the web made by fans. Akiba Blog has posted two interesting variations of Archer's chant from stores found in Akihabara. The first parody, titled "Moe," comes from the Gamers (Broccoli's retail stores) headquarters located in Akihabara, while the second one is AsoBit City's "Plamo" (Plastic Model). 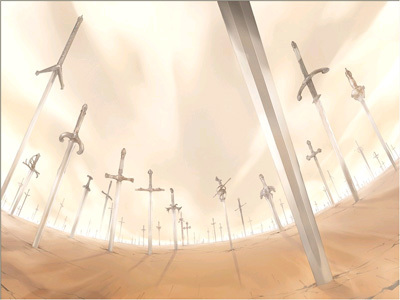 The "Moe" chant is a promotion for the Fate/Stay night Visual Collection. The "Plamo" chant was put out by the store to let people know the store sells plastic models on the 3rd floor. Submitted by Gilgamesh™ (not verified) on Fri, 2007-08-10 21:07. Submitted by yhe macaroni (not verified) on Sun, 2008-05-25 13:18. It gives a smile every time. have withstood lawsuits to steal many weapons. yet, these hands will pay for anything.